Ylang yang is also luscious, buttery, a little apricot-y and – when smelled ‘neat’ – is a tad medicinal, too. (In aromatherapy, it dispels tension.) The note is steam-distilled or solvent-extracted from the creamy flowers of the tall plant (Cananga odorata) – it can be either a tree or a vine, growing to almost 20 metres. Ylang ylang grows in the Phillipines, Java, Réunion and the Comoro Islands. Most of us are unlikely to smell it growing wild, but apparently it’s deliciously, delicately sweet, in flower form. But why the high price? It takes around 400 kilos of flowers to produce one kilo of essential oil, and each tree provides around 10 kilos of flowers a year. Go figure. PS Say it ‘ill-ang ill-ang’. 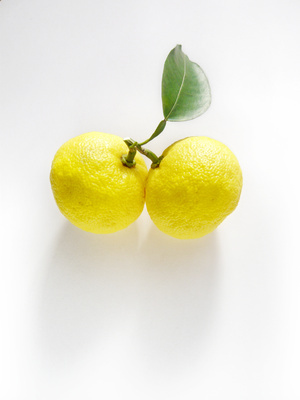 We’ve noticed yuzu turning up in quite a few fragrance compositions lately. It’s a citrus note, often found as part of a zesty blend in colognes. (Latin name: Citrus junos.) The extract comes from the peel of the fruit, and is grapefruit-y and ‘green’ at the same time. Quite aside from its uplifting qualities, yuzu is very useful to perfumers because it prolongs the life of other citrus notes, whose delicious freshness doesn’t tend to linger for long.